Unit designed for Class II, Division II, Group F & G service. Unit has a flat bottom loading skip with 304 stainless steel or UHMW on drum contact to prevent sparking. 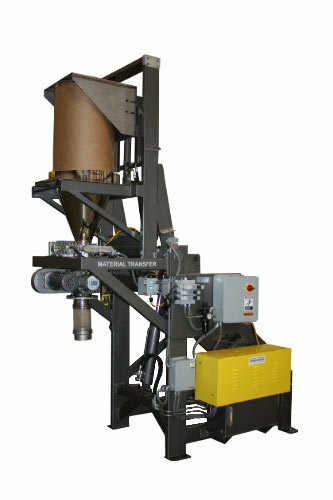 Inverts drums of Magnesium Stearate and feeds product into an existing Sweeco screener. Patented Control LinkTM Rotation System provides 180° drum rotation for complete product discharge. Heavy-duty continuously welded carbon steel tubular frame with Steel-It epoxy finish. MTS Lift & SealTM system seals drums to pour cone for dust-tight discharge. Pour cone includes a fully mounted 6” diameter air actuated slide gate. Slide gate docks to a rotary valve inlet transition with an inflatable seal. 6” diameter DMN rotary valve with BFM outlet nozzle and flexible connector. Includes BFM spigot for screener cover. Dust take-off cowl at pour cone inlet. Electro-polished 304 stainless steel product contact surfaces. Rigid 316 stainless steel hydraulic lines. NEMA 4 rated Hoffman junction box enclosure. Premium quality Parker 2 PM pumping unit with a 2 HP TEFC motor.